We know that sometimes the hardest part of doing an activity is figuring out how to start. 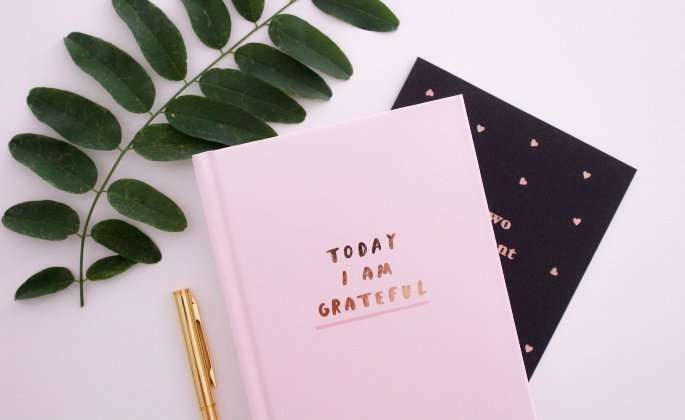 Below are some of our favorite ways to start and organize your gratitude journal. Morning gratitude. Make your gratitude journal a part of your morning routine. Leave a notebook by your bedside and write down three things that you are grateful for before you do anything else. Or, leave your journal on the kitchen table and make it part of your breakfast routine. Write down the date and number three rows. From there, write down whatever comes to mind. It could be, I am grateful for my beating heart, I am grateful that I have a job, and I am grateful for the cereal I am eating. After you write down three things, take a minute or two to close your eyes and reflect on the goodness in your life. On-the-go gratitude. If you can’t quite seem to start a traditional gratitude practice, opt for a more spontaneous one. Make a goal to write down one thing you appreciate each day. You can keep a log in your phone, on your computer, or in a notebook. Whatever works for you! The advantage of the on-the-go gratitude journal is that it leads you to be more appreciative of things as they happen. For example, you may be on a walk and notice a beautiful garden. You can write this down in your journal and reflect upon it in the same moment that you are experiencing it. Nighttime gratitude. Keeping a nightly gratitude journal is often the most common way of practicing gratitude. Similar to the morning journal, keep your notebook near your bed or in a place that is part of your nightly routine. Before going to bed, reflect on your day and write down three things you are grateful for. These things don’t have to be life-changing, they can be as simple as writing down that you appreciated a coworker who asked how your day was. After you write your nightly list, take a moment to reflect upon what you wrote. Use a notebook you enjoy. Choose a notebook or diary that you connect with that feels special. If you like it, you will be more compelled to use it. Start simple. Start your journal practice by writing down three things you are grateful for. They don’t have to be huge events or moments of importance, they can be anything that you feel thankful for. Set a reminder. If you need a nudge to remember, set a daily alarm. Don’t forget to reflect upon what you wrote down. These reflections can become a meditation, which promotes anxiety and stress relief, good sleep, and positive feelings. Talk about it! In addition to expressing your appreciation on paper, start sharing those feelings with those around you when they come up. This can build positive relationships and happiness. Keep going. If you miss a day, it’s okay, just remember to pick your journal up again the next day. According to a 2012 study, grateful individuals experience less minor pains and report feeling healthier. Grateful people are also more likely to appreciate what they have and to take care of their health via preventative measures. They often exercise more, schedule regular medical check-ups, and are more likely to ask for help when they need it. By acknowledging what we are thankful for in our lives, we stop fixating on the negatives. By keeping a daily gratitude practice, your brain becomes more adept at finding good things and focusing on the positives. Essentially, gratitude begets more gratitude. By feeling a state of gratitude, your energy changes and those around you can notice. By living in a state of thanks, you radiate a feeling of kindness and joy. In addition, if you verbalize your gratitude you can improve the lives of those around you by making their day! By living in thankfulness and sharing it with those around you, you can create stronger bonds with those around you and more positive, productive relationships. Keeping a nightly gratitude journal can positively affect your sleep. In a study of 400 individuals, those who rated themselves as having higher levels of gratitude also rated themselves as faster to fall asleep, having better sleep quality, experiencing less insomnia, and suffering from less drowsiness during the day. In short, if you spend time before you fall asleep to reflect on what you are appreciative of, you are more likely to sleep better than if you experience stressful, worried, or anxious thoughts before bed. Gratitude can promote lasting eating disorder recovery. Eating disorder recovery is not easy. We know that. However, there are things you can do to make recovery easier, such as attending treatment and working to change thought patterns. One tool that can ease the eating disorder voice and promote healing is gratitude. By reminding yourself about why you are thankful for recovery, you are less likely to be tempted to fall back into eating disorder behaviors. Moreover, if you do relapse, gratitude can help you get back on track. If you are struggling with recovery, we always recommend writing a list of reasons why you chose recovery and referring back to it for positive motivation. If you are struggling with an eating disorder, reach out to The Emily Program at 1-888-354-5977. The Emily Program provides warm, welcoming eating disorder care to individuals of all backgrounds. If you need support, The Emily Program is here for you.